Get the Guy is the #1 online destination for dating and relationship advice that gets results. Through his massively popular video blogs, powerful online programs and high-impact live events, dating expert Matthew Hussey takes women by the hand and gives them a roadmap to their Mr. Right and an action plan to quickly achieve the love life of their dreams. Matthew’s empowering and revolutionary approach teaches women the exact steps to become “High Value” and communicate their standards in a way that makes them irresistibly attractive to quality men. Here at Get the Guy, women can find Matthew’s use-it-now advice for every stage of dating, from tried-and-true tips to meet the best guys, to little-known communication hacks to have a first date conversation that leaves him begging to take her out again, from secret strategies to take a relationship from casual to committed, to the foolproof formula to a relationship that lasts. Thousands of blissfully happy women around the world credit Matthew’s advice for helping them meet, date, and even marry the love of their lives. 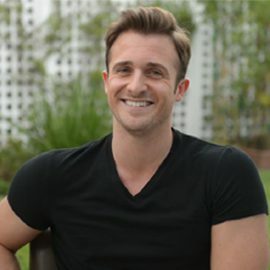 Matthew Hussey is the world’s leading dating expert for women. For the past 8 years he has coached millions of women around the world to help them get the love lives of their dreams. He is a New York Times bestselling author, he has his own national radio show, he’s been given his own television show, Rachael Ray, Katie Couric, Ryan Seacrest, Meredith Vieira, Elvis Duran, Match.com and many others frequently invite him to share his advice. He’s had the privilege of working with royalties and celebrities like Christina Aguilera and Eva Longoria. He’s also coached over 100,000 women in his live seminars and his training videos have reached over 217,000,000 women around the world.